Note Knacks are music notation blocks that your youngest learners can hold and manipulate to create and perform their own musical compositions. These specially proportioned blocks display a musical note on one side and its corresponding rest on the back. Blocks are color coded so when children say the color, they say the rhythm. Note Knacks fit into three time signature frames that ensure children stay within the parameters of conventional notation while enjoying the freedom to create. Above all, Note Knacks are simple to understand and use, and students retain their understanding from week to week. 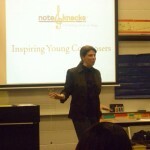 Note Knacks are part of an education method that teachers can use in the classroom to help their students reach the goal of music literacy, all while having fun and increasing self-confidence. 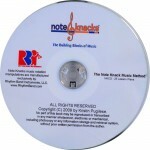 The Note Knacks method is taught in three simple, consecutive phases. Children build on their understanding in each phase, culminating in learning conventional musical notation and making the leap to music literacy. Music teachers can use Note Knacks to show how two half notes equal the length of a whole note, how two quarter notes equal the length of a half note and so on. 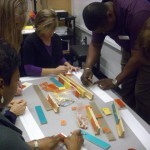 In this physical, hands-on way, young learners immediately make the connection to other concepts taught in their regular classroom.